Choosing which jewelry is going to make the Instagram cut, always hurts a little bit. It’s always a case of kill your darlings. I guess I’ll have to make another one. Bummer ;-) . Jacquie Aiche jewelry on Jacquie Aiche Instagram. 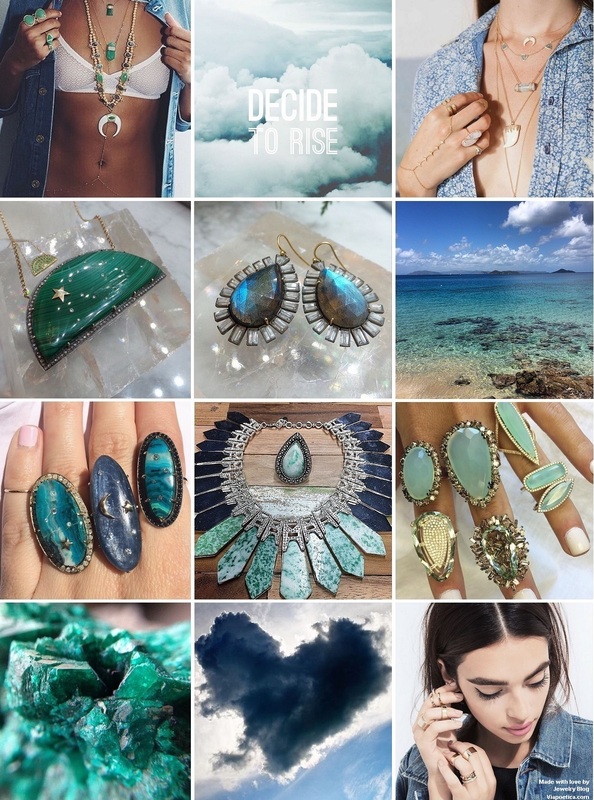 Just a pretty image on the Instagram of jewelry designer Anna Sheffield. I never get tired of Jacquie Aiche’s unique brand of sensual, bohemian jewelry. Jacquie Aiche jewelry on Jacquie Aiche Instagram. Andrea Fohrman’s jewelry on the Ylang23 Instagram account. A very pretty malachite and diamond necklace and one of Fohrman’s signature rainbow necklaces. You may know Nak Armstrong from the former CFDA award winning design duo Athony Nak, but in 2010 they went their separate ways and Nak Amstrong started his own jewelry label. Well if he continues to design this kind of jewelry I’m certainly not complaining! It’s bold and unique. Nak Armstrong on Nak Armstrong Instagram. Via Ylang23. Another pretty image, this time by jewelry designer Shawn Ames on her instagram account. Let’s be honest here, I used this image to give the collage a bit of visual oomph, but that’s no reason to not check out her jewelry ;-) . It’s gorgeous! Again, Andrea Fohrman’s jewelry. Three rings in kyanite, chrysocolla and black and white diamonds. A regram on Samantha Wills‘ instagram account of her stunning Out of the Dark Collar necklace and the Bohemian Bardot ring. Via Samantha Wills & Zambezee boutiques. Suzanne Kalan designs stunning jewelry, but my absolute favorite collection has to be the Vitrine collection, showcased by the two bottom rings. The Vitrine collection put her name on the map and to this day, it’s still one of her best selling collections. Check out her instagram. A pretty close-up of the mineral dioptase. Via fiveofhearts_rockhound. 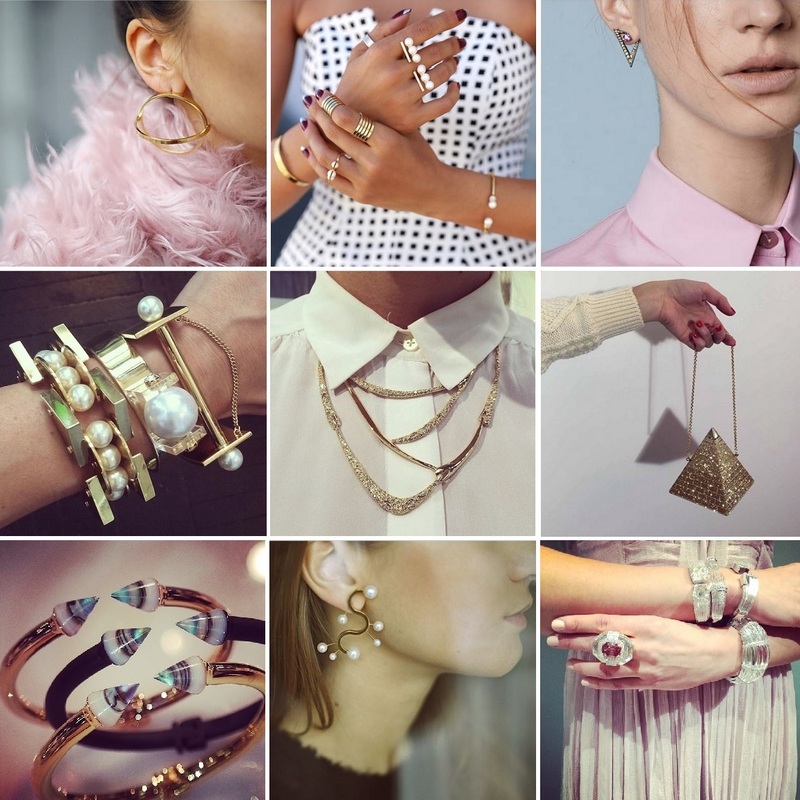 A sweet image of the instagram account of jewelry boutique Broken English Jewelry. Gold rings from the LUV AJ X Jewel Mint collection. Via LUV AJ’s instagram. Another update of some truly great instagram jewelry images. Gold circular earrings by minimalist jewelry designers Uncommon Matters. Found on fashion retailer More is Love’s instagram. Annabelle Fleur of Viva Luxury wearing jewelry by Gold Philosophy. A look at the V Collection campaign of Nikos Koulos jewelry. Check out the instagram. A collaboration between Judith Leiber & model and DJ Harley Newton-Viera resulted in this awesomeness: a pyramid clutch encrusted with 6.718 crystals. Half of which are coated in 24 kt gold. More of this please ^^. Via HVN’s twitter. Wow! Talk about some serious bling! David Webb jewelry showcased by Neiman Marcus. Instagram Neiman Marcus & instagram David Webb. The Monastery of Pearls earring by Smith Grey of the Pearlgatory collection. Abalone shell bracelets by Vita Fede. Images via their instagram (or rather of the designer Cynthia Sakai ;-) ) . Lele Sadoughi is known for her statement jewelry as evidenced by her bold bracelets. Found on the instagram account of ELLE Accessories Director Maria Dueñas Jacobs. A sneek peak of the spring 2015 collection by Alexis Bittar. Via the instagram-account of Marissa Collections.